Neutralizing Tower - Biodiesel Solutions – Biodiesel Machinery Equipment Projects. Uses: Acidic methanol gases methanol produced during the neutralization reaction. The neutralizing tower is connected with alkali tank, alkaline and acidic methanol gas by the countercurrent flow mode entering into the tower. The tower provides with a heating device, the neutralized gases pass through the filling tower and start purifying methanol in the recover y column. 1. 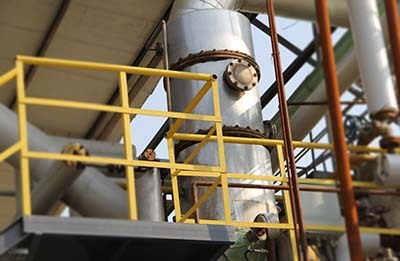 Effectively prevent equipment corrosion, extending the life of equipment. 5. A small amount pressure dropping, operating flexibility and has a good performance in neutralization. 6. Tower made of stainless steel, fillers are used Pall ring which is efficient and low resistance, it can completely remove the odor of gas and hazardous substances.